The rocks of the Earth are like pages of a history book containing information about the past. Geologists who enjoy reading this “book” have found that it consists of two “volumes:” the first, named Precambrian, is mostly devoid of macroscopic fossils. The second, named Phanerozoic, contains layers and sediments providing a rich archive of past forms of animal and vegetal life. The Phanerozoic “volume” is further subdivided in three “sections,” called Paleozoic, Mesozoic and Cenozoic, each consisting of several “chapters” (Fig. 1) . Fig. 1: The geologic column, with its standard subdivisions, including the Paleozoic and its systems. This article focuses on the Paleozoic interval of the geologic record. Estimates from global compilations of maps suggest that about 20% of the surface of the Earth is covered by Paleozoic rocks . 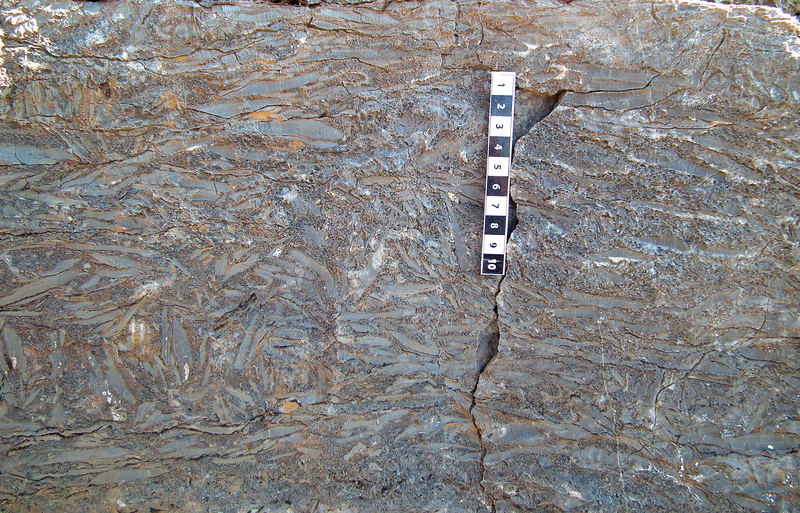 These rocks are usually well preserved, although mineralogical modifications (e.g., recrystallization) and physical disruption (e.g., faulting and folding) are common. Therefore, Paleozoic rocks represent a substantial and accessible part of the rock record and attempting a comprehensive synthesis of their main characteristics in a blog post is an impossible task. This overview concentrates on selected topics about Paleozoic sedimentary rocks, igneous rocks, fossil patterns, and tectonics. The article will close with some suggestions on the significance form a creationist perspective of salient features and trends in Paleozoic rocks. 1) Global Stratigraphic Signal. There is a great variety of types represented in Paleozoic sedimentary rocks. However, when looking at the macroscale, certain types of rocks show a specific frequency increase within the Paleozoic or some of its intervals. This non-random pattern of stratigraphic distribution  is often observed on a global scale. Examples include: Cambrian sandstone composed almost exclusively of quartz (Fig. 2), found across most of the North American continent and documented on other continents ; peaks in abundance of carbonate deposits in the lower and mid-Paleozoic [4, 5], including (for the lower Paleozoic) globally distributed facies such as stromatolites  and flat-pebble conglomerates (Fig. 3) ; widespread marine black shales, rich in organic carbon, common in the lower Paleozoic and upper Devonian-Mississippian ; abundant reef-like deposits in the Silurian and especially in the Devonian [9, 10]; immense coal deposits in the Pennsylvanian and Permian ; and extremely wide and thick accumulations of evaporites in the Permian . Fig. 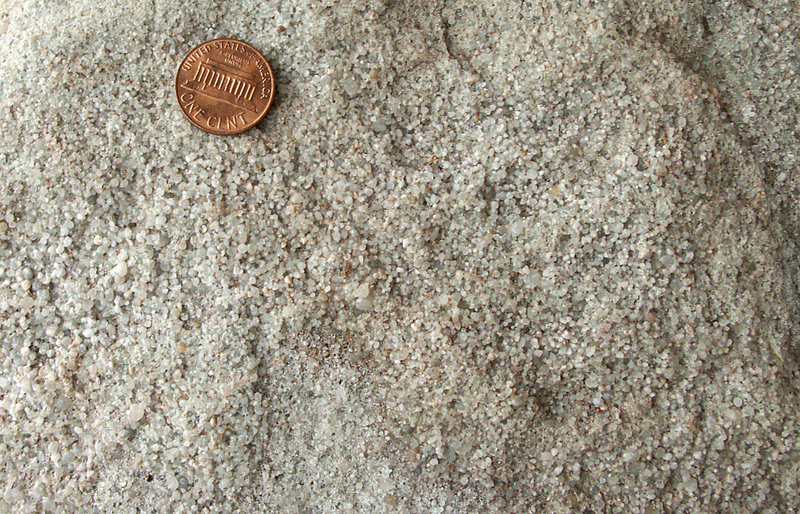 2: An example of Cambrian quartzite, consisting of well rounded and well sorted quartz granules. Sawatch Quartzite, Manitou Springs area, Colorado, USA. Penny for scale is 2 cm wide. Fig. 3: An example of Cambrian flat pebble conglomerate, consisting of variously orientated elongated limestone pebbles, several cm in size. Notch Peak Formation, Millard County, Utah, USA. Scale increments are 1cm wide. 2) Widespread Marine Deposition over the Continents. Lower to mid-Paleozoic sedimentary rocks are remarkable in documenting large-scale flooding and establishment of seas over continental interiors. This is perhaps best seen in the North American rock record, where up to four major successive continent-wide flooding phases can be observed in Paleozoic deposits . The topography of the submerged continents must have been very subdued because the layers deposited over the flooded landscape generally show extremely high lateral continuity and flat basal contacts (Fig. 4). In some cases, even thin beds only a few cm thick can be followed laterally for tens of kilometers . Fig. 4: A classic example of flat contacts between laterally widespread Paleozoic layers. Grand Canyon, Arizona, USA. 3) Upward Increase in Terrestrial Deposits. If it is true that the lower to mid-Paleozoic is dominated by marine deposits even over continental landmasses, terrestrial deposits become substantially more represented in the upper Paleozoic, from the Pennsylvanian upward . In addition, the style of fluvial deposition also appears to differ, with predominantly sheet-like sandy deposits in the lower Paleozoic being complemented from the mid-Paleozoic upward by mud-rich deposits, interpreted as more typical of meandering rivers . When tracing rock units along the vertical direction, it is common to see repetitions of certain types of deposits (e.g., sandstone, mudstone, limestone). The cyclical pattern in these rock types reflects changes in the environments of deposition, such as variations in water depth and sediment supply. These changes in rock types, often marked by discontinuity surfaces between packages of layers, are observed throughout Paleozoic sedimentary deposits. However, in the upper Paleozoic (starting from the upper Mississippian) a marked increase in the frequency of these sedimentary cycles is observed on a global scale . Broadly speaking, lower to mid-Paleozoic relatively monotonous deposits are overlain by cyclical successions more intensely punctuated by discontinuities and alternations of different rock types. 1) Volcanic Rocks. It is difficult to systematically address global trends in volumes and types of volcanism during the Paleozoic, because of limitations due to the incomplete nature of the rock record. Notably, while basaltic rocks of the ocean floor offer a continuous record of submarine volcanism for the Cenozoic and part of the Mesozoic, only slivers of Paleozoic oceanic crust are preserved. However, Paleozoic rocks do contain a record of some notable episodes of volcanic activity. For example, Upper Ordovician deposits from North America and Europe contain a cluster of ash layers attributed to some of the largest explosive volcanic eruptions ever recorded in the whole Phanerozoic [18, 19]. Large igneous provinces (LIPs), which are regions preserving immense volumes of lava effused within a very narrow stratigraphic interval, have also been documented for the Paleozoic. They include Cambrian, Devonian, and Permian examples, the most spectacular being the Siberian Traps in Russia, where an estimated volume of over 2 million km3 of magma were mobilized at the very end of the Paleozoic . 2) Plutonic Rocks. Plutonic rocks form from the solidification of magma at depth in the Earth’s crust and constitute the core of the continents. The study of plutonic rocks, therefore, helps to understand the timing and process of formation of the continents. For example, it would be interesting to know how much of the continental crust formed or was recycled during the Paleozoic. Limitations in dating and the incompleteness of the rock record hamper these types of reconstructions. However, some clues can be obtained in indirect ways. Zircon, for example, is a mineral that forms during the crystallization of magma and is very durable and resistant. Even if the original intrusive rock hosting a zircon is eroded, the detrital zircon may survive and be included in younger rocks. Studies looking at the age distribution of detrital zircons indicate that the Paleozoic was one of several intervals with significant crystallization or recycling of crust . Another way to assess the Paleozoic production of plutonic rocks is to look at their preserved surface area compiled from geologic maps. It appears that Paleozoic plutonic rocks are more abundant on the Earth’s surface than their Precambrian or Cenozoic counterparts . This confirms that the Paleozoic was an interval of significant magma emplacement and crystallization. 1) Diversity Trends. The most remarkable aspect of the Paleozoic rock record is the abundance of macroscopic animal fossils when compared with underlying Precambrian rocks. This major transition has been called the “Cambrian explosion” and occurs in lower Cambrian strata, where fossils of most animal phyla first appear . An equally important interval is what has been called the Great Ordovician Biodiversification Event (GOBE), referring to a remarkable increase in diversity of marine fossil groups in the Lower to Mid-Ordovician . The Cambrian explosion is unique for the sudden appearance of a large number of new animal body plans, but the GOBE shows the greatest increase in diversity of fossil forms within already known body plans. As a result of these two important stratigraphic intervals, Paleozoic marine faunas can be broadly divided in two groups : the Cambrian fauna (dominated by trilobites) and the overlying Paleozoic fauna (dominated by suspension feeders such as brachiopods, bryozoans, crinoids, and corals) (Fig. 5). These faunas are punctuated by several turnovers at specific stratigraphic levels (e.g., top of Ordovician and, most significantly, top of Permian), where the coordinated disappearance of certain groups is observed . Fig. 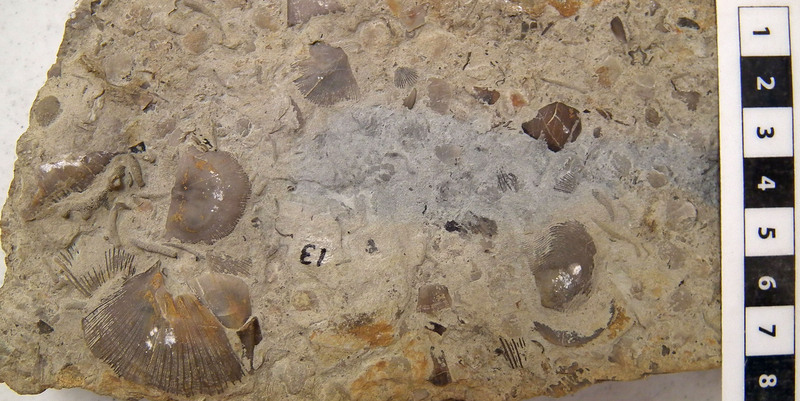 5: Close up view of a typical example of a lower Paleozoic marine fossil assemblage after the GOBE. Brachiopods, bryozoans, and crinoids make up most of the skeletal fragments seen in the picture. Upper Ordovician Richmond Group, Hueston Woods State Park, Ohio, USA. Scale increments are in cm. 2) Ecological Trends. Along with increased diversity, the GOBE seems to mark a shift to marine faunal assemblages representative of greater ecological complexity . Cambrian layers contain mostly invertebrates that lived on the surface of bottom sediments, but overlying strata include planktonic organisms, fish, burrowers, and suspension feeders that stood taller above the bottom because they were erect. Another important transition is observed in mid-Paleozoic strata, where the fossil record ceases to include only marine organisms and begins to document terrestrial organisms. Macroscopic fossils of land plants first appear in the Silurian and become more common in the Devonian , terrestrial invertebrates (including insects, spiders, and millipedes) first appear in the Devonian , and a few tracks and remains of land vertebrates first appear in the Devonian  but become common in the Carboniferous. Notable groups completely absent from Paleozoic layers are dinosaurs, mammals, birds, and flowering plants. Reconstructions based on paleomagnetism and distribution of major orogenic belts seem to indicate that the initial Paleozoic configuration of continents consisted of four distinct major continental masses, one of which (named Gondwana) grouped all the current continents of the southern hemisphere . Interestingly, whereas most of the margins of these continents show lowermost Paleozoic patterns of sedimentation typical of passive, extensional margins, a remarkable tectonic shift is observed in the Upper Cambrian to Ordovician, where most of these continental margins show evidence for the onset of large scale active convergence . An intriguing aspect of Ordovician plate tectonics is that none of the widespread convergent margins seem to involve collision between continents but only accretion of microcontinents and volcanic arcs, a condition not seen in any other part of the Phanerozoic . A sustained trend of convergence is consistently documented by orogenic belts along continental margins throughout the Paleozoic, resulting in the progressive amalgamation of the different continental masses. Paleogeographic reconstructions indicate that the continents were finally assembled into a supercontinent (named Pangea) by the Early Permian, a configuration that persisted to the end of the Paleozoic . Another feature of interest for Paleozoic plate tectonics is the suggestion of a Cambrian episode of significant true polar wander [34, 35]. This phenomenon implies the redistribution of continental masses with respect to Earth’s axis of rotation resulting in movements of tens of degrees of latitude (e.g., from polar to tropical latitudes) and representing a mechanism of plate motions faster than and different from classic plate tectonics. The existence of a discontinuity in terms of fossil content between the Precambrian and the Paleozoic makes it tempting for creationists to link this horizon to a major discontinuity in Earth’s history. This perception is reinforced when considering that the base of the Paleozoic is often expressed with a physical stratigraphic discontinuity  that marks a mechanical-erosional boundary and a significant shift in sedimentary and tectonic conditions . From a biblically informed perspective, a possible candidate to generate such discontinuity would be the global flood of Genesis 6-8. Some Paleozoic sedimentary patterns would fit well on a general level with the description of the biblical catastrophe, in particular the patterns of extensive flooding of continental masses and global signature in the style of sedimentation. Extensive plate rearrangements could also be hypothesized as part of the flood event, and the lowermost Paleozoic presents an interesting interval where both fast plate reorganization and change in predominant tectonic regime seem to be documented. Certainly, plate tectonics offer an important background mechanism to explain several Paleozoic trends. For example, the progressive assembly of Pangea might have controlled the Paleozoic trend in increasing terrestrialization observed both in the sedimentary and fossil record. Interestingly, this parallel increase in preservation of continental deposits and land fossils supports the suggestion of creationists that trends in appearance of fossil groups result at least in part from sampling of different habitats and ecosystems rather than biological evolution. The trend toward a supercontinent configuration might also have played a role in the switch to higher frequency cyclicity observed in the upper Paleozoic sedimentary record, as clastic material from exposed landmasses with extensive drainage systems became more available. Finally, active plate convergence during the Paleozoic would account for the modal peak in Paleozoic igneous rocks, as continental collision settings tend to be favorable for the preservation of new continental crust . In the modern history of creationism, the general consensus about where to place Paleozoic rocks in biblical history has followed an interesting trajectory. The majority of Scriptural geologists, in the first half of the 19th century, assigned the formation of Paleozoic rocks to the time between Day 3 of creation and the onset of the flood . The trend was decidedly reversed in the 20th century, when key figures such as G. Price, H. Clark, H. Morris, and J. Whitcomb clearly interpreted the formation of Paleozoic fossil-bearing rocks as a consequence of the flood . In the past two decades, there has been renewed consideration among some creationists of the possibility that part of the Paleozoic might have been deposited before the flood [40, 41]. Given the immensity of data archived in the Paleozoic rock record, any attempt at a synthetic model from a creationist perspective will have to find the delicate balance between an ability to see the bigger picture without overlooking important details. Before that balance is reached, an exciting work of study and discovery will continue to accompany us in our journey. Dürr, H.H., M. Meybeck, and S.H. Dürr, Lithologic composition of the Earth's continental surfaces derived from a new digital map emphasizing riverine material transfer. Global Biogeochemical Cycles, 2005. 19(4): p. n/a-n/a. This study estimates that Paleozoic sedimentary and volcanic rocks cover 15.8% of Earth's surface. However, metamorphic and igneous rocks are not included in the estimate. The undifferentiated cover of metamorphic and igneous rocks is estimated at about 12% of Earth's surface. Assuming that one third of this 12% of undifferentiated cover is Paleozoic, we arrive at the 20% figure. For a recent treatment of this feature of the stratigraphic record see Brett, C.E., et al., Time-specific aspects of facies: State of the art, examples, and possible causes. Palaeogeography, Palaeoclimatology, Palaeoecology, 2012. 367–368(0): p. 6-18. Peters, S.E. and R.R. Gaines, Formation of the `Great Unconformity' as a trigger for the Cambrian explosion. Nature, 2012. 484(7394): p. 363-366. Mackenzie, F.T. and J.W. Morse, Sedimentary carbonates through Phanerozoic time. Geochimica et Cosmochimica Acta, 1992. 56(8): p. 3281-3295. Riding, R., Microbial carbonate abundance compared with fluctuations in metazoan diversity over geological time. Sedimentary Geology, 2006. 185(3–4): p. 229-238. Kim, J.C. and Y.I. Lee, Flat-Pebble Conglomerate: A Characteristic Lithology of Upper Cambrian and Lower Ordovician Shallow-Water Carbonate Sequences, in Ordovician Odyssey, Short papers, International Symposium on the Ordovician System, 7th, Fullerton, California Pacific Section, SEPM (Society for Sedimentary Geology). 1995. p. 371-374. Arthur, M.A. and B.B. Sageman, Marine Black Shales: Depositional Mechanisms and Environments of Ancient Deposits. Annual Review of Earth and Planetary Sciences, 1994. 22(1): p. 499-551. Kiessling, W., Geologic and Biologic Controls on the Evolution of Reefs. Annual Review of Ecology, Evolution, and Systematics, 2009. 40(1): p. 173-192. Copper, P. and C.R. Scotese, Megareefs in Middle Devonian supergreenhouse climates, in Extreme depositional environments: Mega end members in geologic time, M.A. Chan and A.W. Archer, Editors. 2003, Geological Society of America Special Paper 370 Boulder, Colorado. p. 209-230.
de Sousa e Vasconcelos, L., The petrographic composition of world coals. Statistical results obtained from a literature survey with reference to coal type (maceral composition). International Journal of Coal Geology, 1999. 40(1): p. 27-58. Warren, J.K., Evaporites through time: Tectonic, climatic and eustatic controls in marine and nonmarine deposits. Earth-Science Reviews, 2010. 98(3–4): p. 217-268. Sloss, L.L., Sequences in the Cratonic Interior of North America. Geological Society of America Bulletin, 1963. 74(2): p. 93-114. Brett, C.E., P.I. McLaughlin, and G.C. Baird, Eo-Ulrichian to Neo-Ulrichian views: The renaissance of" layer-cake stratigraphy". Stratigraphy, 2007. 4: p. 201-2015. Wall, P.D., L.C. Ivany, and B.H. Wilkinson, Revisiting Raup: exploring the influence of outcrop area on diversity in light of modern sample-standardization techniques. Paleobiology, 2009. 35(1): p. 146-167. Davies, N.S. and M.R. Gibling, Cambrian to Devonian evolution of alluvial systems: The sedimentological impact of the earliest land plants. Earth-Science Reviews, 2010. 98(3–4): p. 171-200. Wright, V.P. and S.D. Vanstone, Onset of Late Palaeozoic glacio-eustasy and the evolving climates of low latitude areas: a synthesis of current understanding. Journal of the Geological Society, 2001. 158(4): p. 579-582. Mason, B.G., D.M. Pyle, and C. Oppenheimer, The size and frequency of the largest explosive eruptions on Earth. Bulletin of Volcanology, 2004. 66(8): p. 735-748. Sell, B., L. Ainsaar, and S. Leslie, Precise timing of the Late Ordovician (Sandbian) super-eruptions and associated environmental, biological, and climatological events. Journal of the Geological Society, 2013. 170(5): p. 711-714. Ernst, R.E. and K.L. Buchan, Large mafic magmatic events through time and links to mantle-plume heads, in Geological Society of America Special Papers 352, R.E. Ernst and K.L. Buchan, Editors. 2001: Coulder, CO. p. 483-575. Voice, P.J., M. Kowalewski, and K.A. Eriksson, Quantifying the Timing and Rate of Crustal Evolution: Global Compilation of Radiometrically Dated Detrital Zircon Grains. The Journal of Geology, 2011. 119(2): p. 109-126. Wilkinson, B.H., et al., Global geologic maps are tectonic speedometers—Rates of rock cycling from area-age frequencies. Geological Society of America Bulletin, 2009. 121(5-6): p. 760-779. This surface distribution only refers to plutonic rocks that have not been subsequently metamorphosed, therefore excluding orthogneisses or other crystalline rocks derived from a plutonic precursor. Marshall, C.R., Explaining the Cambrian “explosion” of animals. Annual Review of Earth and Planetary Sciences, 2006. 34(1): p. 355-384. Servais, T., et al., Understanding the Great Ordovician Biodiversification Event (GOBE): Influences of paleogeography, paleoclimate, or paleoecology. GSA Today, 2009. 19(4): p. 4-10. Sepkoski, J.J., A Factor Analytic Description of the Phanerozoic Marine Fossil Record. Paleobiology, 1981. 7(1): p. 36-53. Bambach, R.K., Phanerozoic biodiversity mass extinctions. Annual Review of Earth and Planetary Sciences, 2006. 34(1): p. 127-155. Edwards, D. and N.D. Burgess, Plants, in Paleobiology: A Synthesis, B. D.E.G. and P.R. Crowther, Editors. 1990, Blackwell Scientific Publications. p. 60-64. Selden, P.A., Invertebrates, in Paleobiology: A Synthesis, B. D.E.G. and P.R. Crowther, Editors. 1990, Blackwell Scientific Publications. p. 64-68. Niedzwiedzki, G., et al., Tetrapod trackways from the early Middle Devonian period of Poland. Nature, 2010. 463(7277): p. 43-48. Meert, J.G. and B.S. Lieberman, The Neoproterozoic assembly of Gondwana and its relationship to the Ediacaran–Cambrian radiation. Gondwana Research, 2008. 14(1–2): p. 5-21. Boger, S.D. and J.M. Miller, Terminal suturing of Gondwana and the onset of the Ross–Delamerian Orogeny: the cause and effect of an Early Cambrian reconfiguration of plate motions. Earth and Planetary Science Letters, 2004. 219(1–2): p. 35-48.
van Staal, C.R. and R.D. Hatcher, Global setting of Ordovician orogenesis, in The Ordovician Earth System, S.C. Finney and W.B.N. Berry, Editors. 2010, Geological Society of America Special Papers 466. p. 1-11. Lewandowski, M., Assembly of Pangea: Combined paleomagnetic and paleoclimatic approach. Advances in Geophysics, 2003. 46: p. 199-236. Kirschvink, J.L., R.L. Ripperdan, and D.A. Evans, Evidence for a Large-Scale Reorganization of Early Cambrian Continental Masses by Inertial Interchange True Polar Wander. Science, 1997. 277(5325): p. 541-545. Maloof, A.C., et al., Combined paleomagnetic, isotopic, and stratigraphic evidence for true polar wander from the Neoproterozoic Akademikerbreen Group, Svalbard, Norway. Geological Society of America Bulletin, 2006. 118(9-10): p. 1099-1124. Hawkesworth, C., et al., Geochemistry: A matter of preservation. Science, 2009. 323: p. 49-50. Numbers, R.L., The creationists: From scientific creationism to intelligent design. 2006: Harvard University Press. Brand, L., Wholistic geology: Geology before, during, and after the biblical Flood. Origins, 2007. 61: p. 7-34. 41. Gentet, R.E., The CCC Model and its geologic implications. Creation Research Society Quarterly, 2000. 37: p. 10-21.